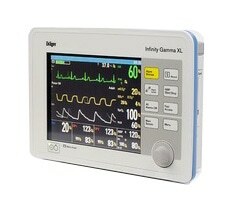 The Infinity Gamma XL patient monitor from Drager gives you the ability to monitor all the essentially used parameters. These parameters include ECG, arrhythmia analysis, respiration, SpO2, pulse rate, temperature, and noninvasive and invasive blood pressure. This monitor can be used for patient care on adult, pediatric and neonatal patients.